Excellent Professional quality Hairdressing scissors. Black Barber Razor. Scissors made of high grade Stainless Steel. Scissors has detachable finger rest. Best Size For Long and Short Hair. Evenly sharp blades for highly professional use. Clipper oil. Products shown inside The Clipper Station for display only- they are not sold with the organizer. This grooming tool organizer is designed to help prevent clippers from falling to the floor and reduces the stress on the cords caused by hanging. 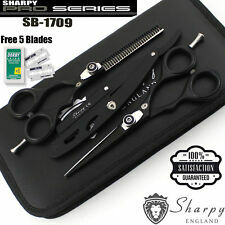 PROFESSIONAL SALON HAIRDRESSING HAIR CUTTING THINNING BARBER SCISSORS SET RAZOR Sharp Scissors. Professional Hair Cutting/Thinning Scissors Barber Shears Hairdressing Set 6.5". 1 x 6.5" Hairdressing Barber Scissors. Excellent For Professional Quality Hairdressing Scissors. Barber Razor. Scissors Has Detachable Finger Rest. Suits Both Long & Short Hair. Used by Professional World Wide. Evenly sharped Blades For High Professional Use. 1 Regular Barber Hairdressing Scissor. 1 Regular Barber Hairdressing Thinning Scissors. 1 Gold Razor. Colour: Gold and Black. Handle: Offset. Finger rest: Fixed. 1 Box of blade ( box includes 5 double Edge 7'o Clock Gillette Blades). Hair Scissors, Hairdressing Scissors, Barber Salon Scissors, Hair Cutting Thinning Scissors, professional Hair Scissors, Hair Styling Scissors Set, Dog Grooming Scissors, professional Thinning Scissors. 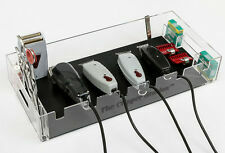 Professional Barber Hairdressing Hair Cutting and Thinning Set 5.5". 1 Regular Barber Hairdressing Scissors. 1 Regular Barber Thinning Scissors. Razor edge blades ideal for all cutting. Premium Set screw. Excellent Professional quality Hairdressing scissors. Black Barber Razor. Scissors made of high grade Stainless Steel. Scissors has detachable finger rest. 1x Black Razor. Best Size For Long and Short Hair. •These scissors are designed for use on hair only. •Razor Edge blades ideal for all cutting techniques. •Extra Sharp blades give more strength to cut thick dry and wet hairs. •Made of High Carbon Japanese Stainless Steel. An ideal bag for keeping all your salon accessories together. Grey Camo Print. • Comfort grip handle plus detachable shoulder strap. Key Features Beautifully designed, handmade using good quality material. 1 Regular Barber Hairdressing Scissor. 1 Regular Barber Hairdressing Thinning Scissors. 1 Gold Razor. Colour: Gold and Black. Handle: Offset. Finger rest: Fixed. (FOR REST OF THE WORLD). 1 Box of blade ( box includes 5 double Edge 7'o Clock Gillette Blades). Razor sharp. suitable for wet and dry hair. A free, high quality, smooth, leather pouch. sword sharp edge. smooth to touch. polished to a high standard finish. Japanese stainless steel. rust proof. Excellent Professional quality Hairdressing scissors. Black Barber Razor. 1x Hair Comb. Scissors made of high grade Stainless Steel. Scissors has detachable finger rest. 1x Black Razor. Best Size For Long and Short Hair. Style : Hairdressing /Barber Salon Hair cutting Scissors. Blades : Sharp Blades. We believe communication can solve any problem. An ideal bag for keeping all your salon accessories together. • Comfort grip handle plus detachable shoulder strap. Key Features Beautifully designed, handmade using good quality material. This session bag is a must for the stylist. This Hairdressing scissors has sharp blades for perfect hair cutting and for highly professional use. This hairdressing scissors has adjustable tension screw, finger rest & removable finger inserts. GRIP - Removable rubber handle inserts to fit any thumb and finger with comfort grip. USE - With a length of 5.5" (approx) it is safe and easy to use on any age. We stand behind our products 100%. Sporting Goods. Excellent Professional quality Hairdressing scissors. 1x Black Barber Razor. 1x Hair Comb. Scissors has detachable finger rest. Scissors made of high grade Stainless Steel. Best Size For Long and Short Hair. A high quality professional Scissor. These scissors are handmade, made of 420-J2 high carbon Japanese stainless steel for professional use. Long lasting razor edge convex hollow ground blades, Comfortable & stylish design with finger rest, Designed to cut hair smoothly without causing any strain to your fingers. 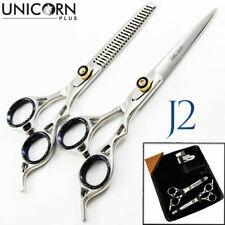 Professional Hair Thinning Scissors, Barber Hair Cutting Scissors Shears, Hairdressing Scissors Shears, Pet grooming Scissors. 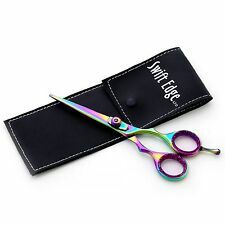 Hair Scissors, Hairdressing Scissors, Barber Salon Scissors, Hair Cutting Thinning Scissors, professional Hair Scissors, Hair Styling Scissors Set, Dog Grooming Scissors, professional Thinning Scissors. Left Handed, Silver Polished, Hairdressing Barber Salon Scissors & Thinning Scissors Set 5.5". Left Handed Hairdressing Thinning Barber Scissors Salon Hair Shears Set 5.5". 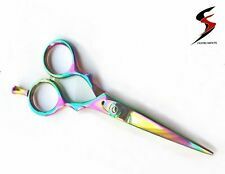 We manufacture only the finest quality professional hair cutting scissors and hair shears. Keep in one safe place and easy access to use. tem Scissors Holster Pouch with Strap. POCKETS SCISSOR,RAZOR ,COMB AND OTHER SALON TOOLS . Textile LEATHER. Excellent Quality Barbers, Hairdressers Multi I. •1 Regular Barber Hairdressing Scissors 6". Colour: Gold. Extra-long cutting performance and protects against nickel allergies. Deep freezing process gives longer lasting cutting performance. Easy to adjust tension tuning. Excellent For Professional Quality Hairdressing Scissors. Barber Razor & COMB. Scissors Has Detachable Finger Rest. Suits Both Long & Short Hair. Used by Professional World Wide. Evenly sharped Blades For High Professional Use. Forbici 5.5"13.97cm Professionali Parrucchiere Qualità italiana (wa0030) Specifica Codice particolare = wa0030. Le forbici sono realizzate in acciaio inox di alta qualità. Cell 3920005124. ARSUK Plastic Curved Scissor 5.5" -14cm(Arrox). Made of highest quality 420c Japanese stainless steel. Health & Beauty. We stand behind our products 100%. Best Deals. Sporting Goods. Add to Favourites. Neues AngebotCLASSIC professional Hairdressing Hair Cutting Barber Shear and Scissors 5"
Razor sharp. suitable for wet and dry hair. sword sharp edge. smooth to touch. polished to a high standard finish. Japanese stainless steel. rust proof. removable rubber finger grip. Step 2: Put the clipper ruler in hair and fix the hair you want to cut. Step 3: Move the clipper ruler side to side until the air bubble is in the middle. White ruler for longer hair, blue ruler for the shorter hair (for example fringe). 6.5" PROFESSIONAL SALON HAIRDRESSING HAIR CUTTING BARBER SCISSORS PET DOG/CAT HAIR CUTTING SCISSORS. 1x 6.5” Barber Salon Hairdressing Scissors DOG Grooming scissors. Excellent Professional Quality Hairdressing scissors. • 1 Regular Barber Thinning Scissors. 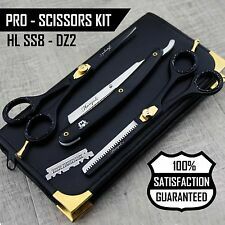 Professional Barber Hairdressing Hair Cutting Scissors Set 5.5". • 1 Regular Barber Hairdressing Scissors. Razor edge blades ideal for all cutting. 1x Thinning Scissor. Scissors Size :6". 1x Cutting Scissors. Deatachable Finger Rest. Used by Professional Over Worldwide. Professional for Professionals. Well Crafted And Hand Made. We Also Deal In Whole Sale. This curved scissor is perfect for eyebrow, nail,Nose and cuticle use. Fine Curved Blade. Surgical Stainless Steel. Than k You. Professional Hairdressing Barber Salon Cutting Scissors Shears Japanese 5"-8.5"
KENSAI SCISSORS 6.0 OFFSET. Strongest & Highest Level of Japan Steel Used in Kensai Scissors. The roots of our scissors goes back to the ancient Japan. When in 1584, Kensai (a legendary warrior MIYAMOTO MUSASHI) was born. Swivel Thumb Pro Hair Cutting Scissors Hairdressing Barber Shears Right Hand 6"
Hair scissors parts full set of scissors screw system with 50 parts.